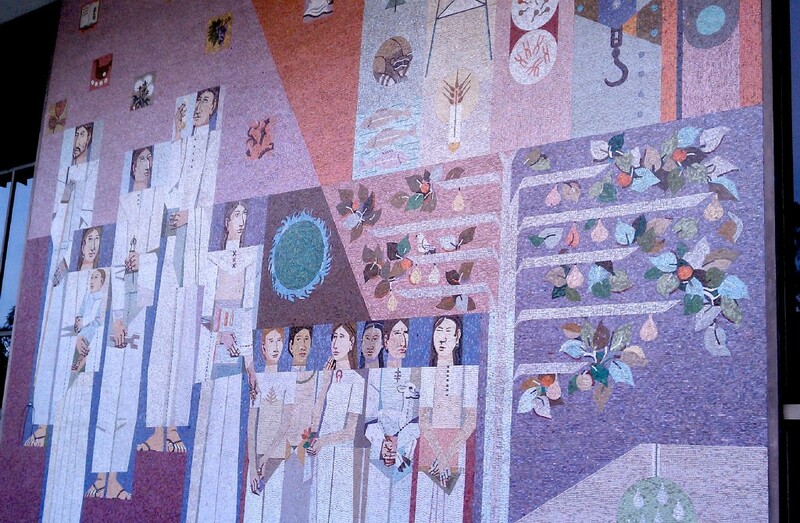 As a quick follow-up to my recent posts about the Sheets Studio’s relationship with the Ravenna Mosaic Company and the questions of religious symbols in artwork for public patrons, I present these mosaics, designed by Richard Haines for the federal building at 300 N. Los Angeles Street in 1963. 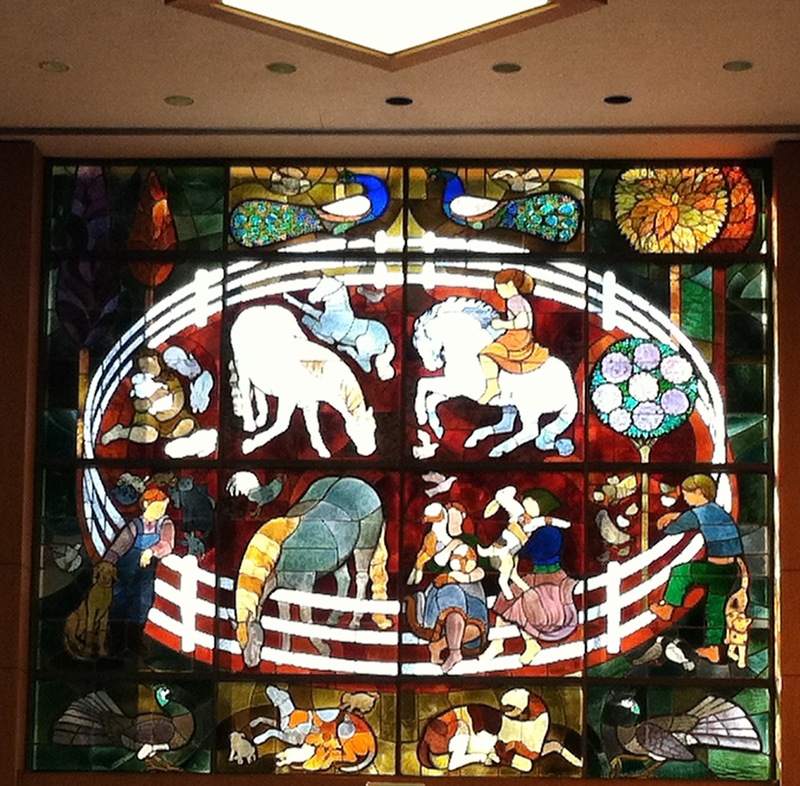 UPDATE: Just after posting, I have learned via John Waide and the Ravenna Mosaic archives at St. Louis University, that Sheets, Haines, and a mosaic designer listed only as DeRosen (likely Jan Henryk de Rosen) had all bid for the UCLA Music Hall job in 1954, but that Haines eventually received it. 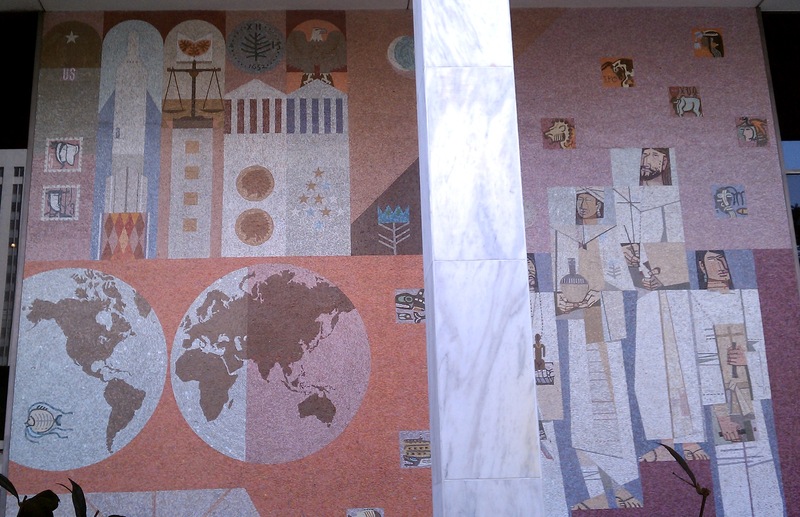 The mosaic depicts many symbols of justice and harmony, showing two hemispheres, flowering trees, small images of animals and industry—and then collections of white-robed people, carrying gifts and tools. Though perhaps no more than one is holding an overtly religious symbol, the sense of a procession and of communal action in white robes is as evocative of a choir and a baptism as much as the Parthenon frieze or the art and architecture of the United Nations. But perhaps evocative is the key word–no explicit religious symbols, and hence no controversy? Back next week to Sheets and Home Savings. California Home Savings locations on the landscape, Home Savings calendar, 1978. Courtesy of George Underwood. As the semester revs up, longer and shorter posts will be alternating here, on somewhat of a regular schedule. 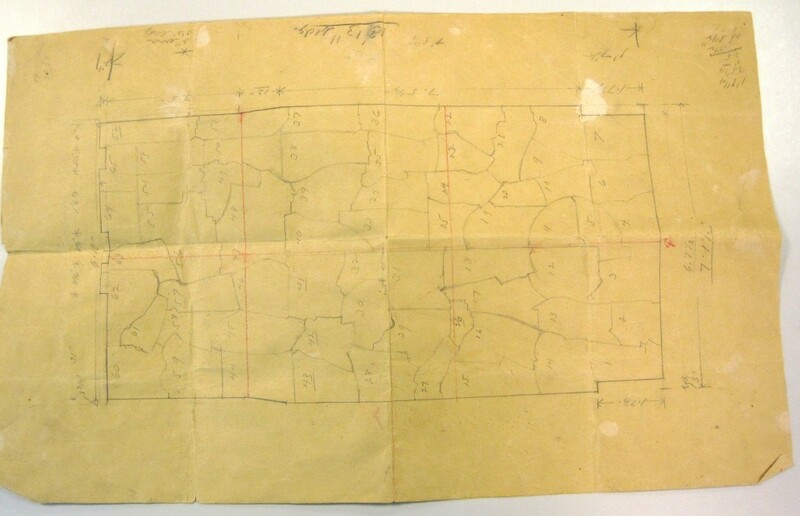 Today, a short one, as a postscript to recent posts on the use of maps by Home Savings to connect to customers in Illinois, Missouri, New York, and other new states with branches in the 1980s. Here Home Savings is put on the map of California, its home state — but in a very different format. This is from a calendar, rather than a road map, and that probably helps — the size of the state and the number of branches might overwhelm the other format (though I hear one exists). 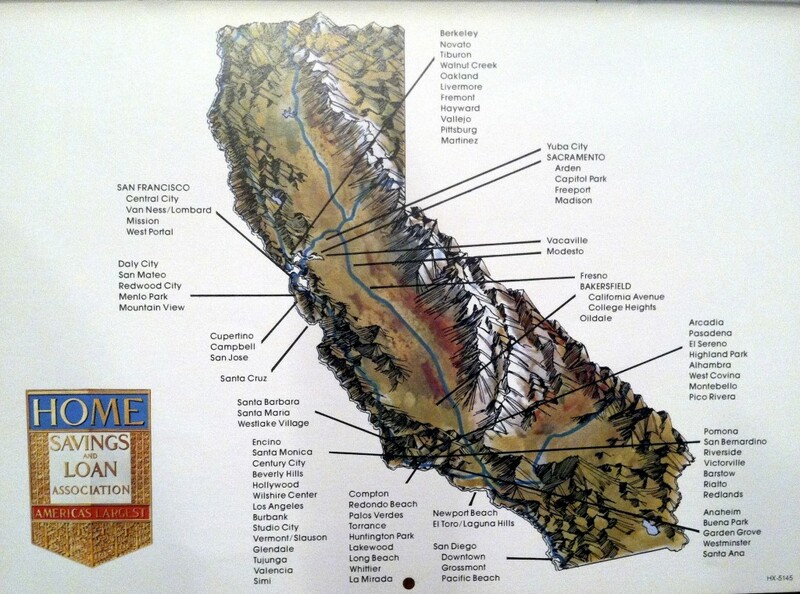 While the eastern maps emphasize the convenience along the roads, here Home Savings is represented on a natural-resources map of California–emphasizing, in an even more dramatic way, the history and rootedness Home Savings strove for. More in the weeks ahead about that Home Savings shield in the bottom left corner. 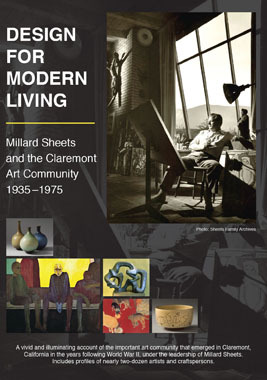 Then, starting September 2014, I have a year to write up this research on the art, architecture, and urban context of the Millard Sheets Studio work for Home Savings & Loan, thanks to Howard Ahmanson Jr. and the Ahmanson Foundation. So I will be much more active here, and around southern California, starting then. Eric Abrahamson’s new book, Building Home, describes the first interactions between Millard Sheets and Howard Ahmanson, and says some about the National American Fire Insurance building. It is crucially important but hard to document, since its demolition in the process of the construction of the Ahmanson Center. The images you see here come from the remarkable collection of mostly color sketches for sale via Alan Wofsy Fine Arts, in San Francisco; these and more appear on their website, with prices and other details. But my work in the Ravenna Mosaic Company papers have provided more insights about their fabrication and installation. In the early 1950s, Sheets and the Ravenna Mosaic Company did work for Mike Lyman’s restaurant (unclear which one — they were once at 424 W. 6th St, on Pershing Square according to designs in the Library of Congress Winold Reiss collection; and 1627 North Vine in Hollywood and Hill at 8th downtown, according to this matchbook or Mike Lyman’s flight deck at the airport, in this old footage— all now demolished) as well as the Precious Blood church in Los Angeles. 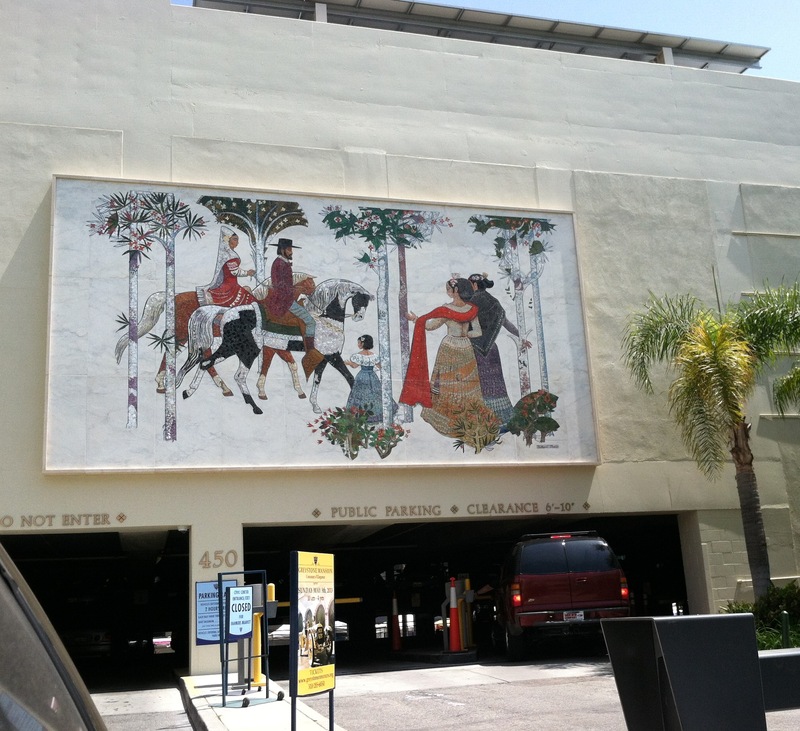 They also discuss a General Insurance building mosaic on Wilshire — which may have been for the building at Wilshire and La Brea by that name — but if so, it is gone too. What we do have, however, is discussion of “the Firemen’s Panel” that the Ravenna Mosaic Company had done for Sheets–and the installation diagrams. And so, in order to get the installation correct, you needed a map of the mosaic, matching the pieces back into the correct order. They existed for every installation, but they were mostly destroyed — but it just so happens that the Ravenna Mosaic Company kept a copy, when they sent another to Sheets for installation. Ravenna Mosaic Company, General [National American] Fire Insurance Building, Los Angeles, 1954-1955, courtesy of Saint Louis University Libraries Special Collections. Special thanks to John Waide. And though it is referred to as the “General Fire Insurance Company,” and it is also along Wilshire, it is clear from the shape that it was the mosaic over the door at the National American Fire Insurance Company of Howard Ahmanson, at 3731 Wilshire — and the start of a remarkable partnership in art, architecture, and urbanism. Apropos of my talk this month in St. Louis, many of March’s posts will draw upon the eye-opening information in the Ravenna Mosaic Company files at St. Louis University, which John Waide has helped me access. 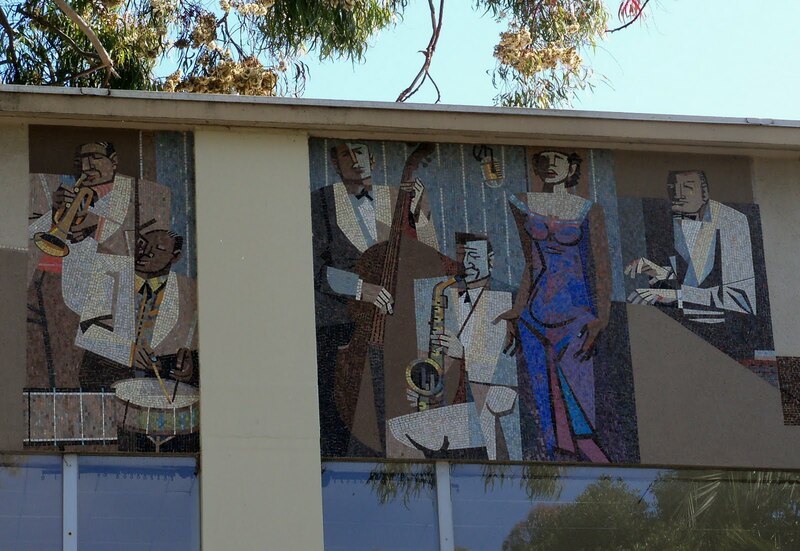 The files on this mosaic from Garden Grove have helped me resolve an ongoing question raised by conversations with mosaicist and mosaic historian Lillian Sizemore: Where does the Sheets Studio mosaic style come from, and why does it change so often? 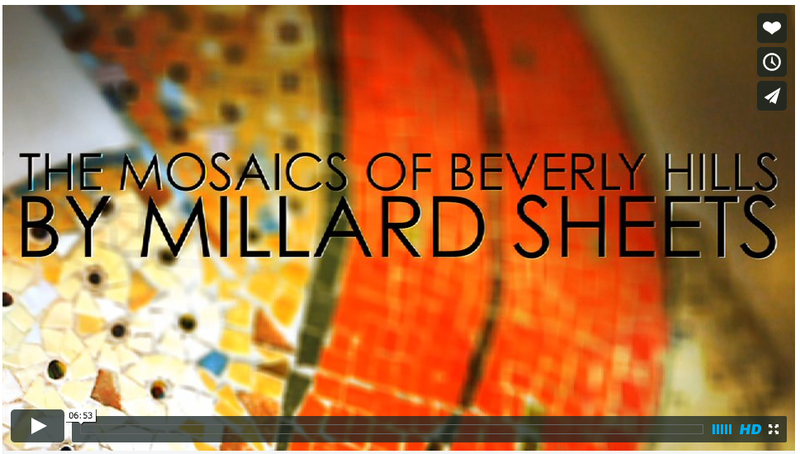 We have discussed the Ameses, the role of Martha Menke Underwood, and the later innovations of Denis O’Connor, and the last mosaics fabricated in Italy, but the questions around the initial mosaics, 1954-1960, remained: Is the style the work of Millard Sheets, or the imprint of his fabricators? Were the fabricators Italian, or Ravenna Mosaic (who are actually German), or Sheets’s own studio? Now the Ravenna Mosaic Company records can provide an answer, in the form of a complaint. Thus, it is clear that the innovations of Sheets’s design that gave it depth and life– the plane-splitting diagonal lines, the articulation of variegated color, and the contrasting colors — were innovations for the Ravenna Mosaic Company, and required a new technique (and greater cost) than their normal procedures. 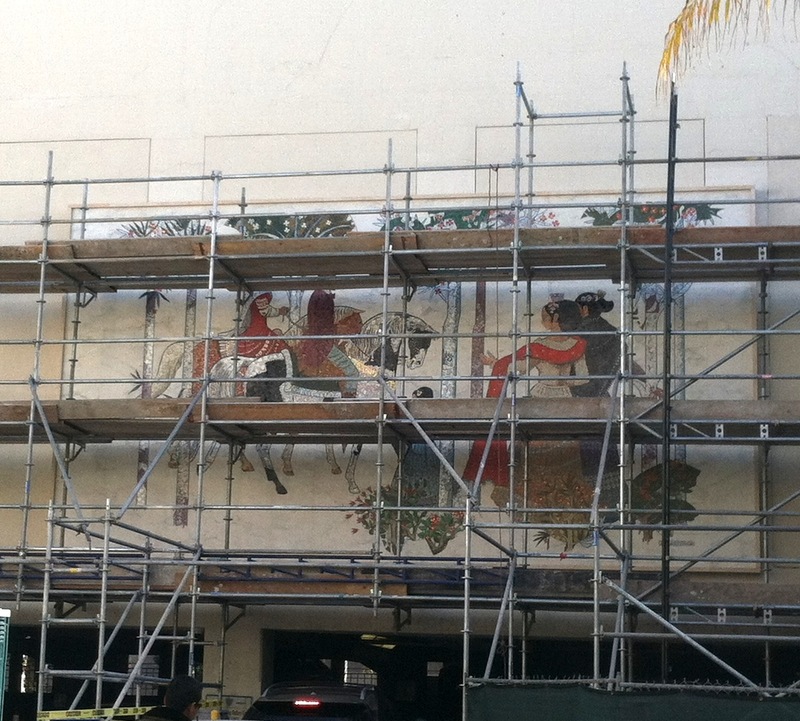 Given a discussion of work for Arcadia (see my next post), it seems the Sheets Studio was already doing some mosaic work in-house–likely including the small paintings/mosaics for Compton. But by 1961, with the arrival of Martha Menke Underwood and then Denis O’Connor as members of the Sheets Studio, they began to do all this work themselves, beginning with the Scottish Rite Temple in Los Angeles. But this letter — its surprise, its wonder, and its admiration — demonstrates when Sheets’s new style for mosaics began to emerge, despite the difficulties it left for his fabricator.